The phrase 'You either love 'em or you hate 'em' could be used to describe several rock bands, but it seems custom-made for thrash veterans Overkill. Few bands throughout the history of heavy metal have thrashed as intensely or possessed a singer like Bobby "Blitz" Ellsworth (whose vocals give 'piercing' a whole new meaning). But the band (or more succinctly, mainstays Ellsworth and bassist D.D. Verni) admirably stuck to their guns through it all. Whereas many metal veterans could be spotted donning flannel shirts in the early '90s or trying out their rap skills around the turn of the century, Overkill has turned a blind eye to trends. And while they never infiltrated the mainstream like Anthrax or Megadeth, their perseverance has paid off, as they retain a strong following to this day, and continue to crank out albums, such as 2005's ReliXIV. 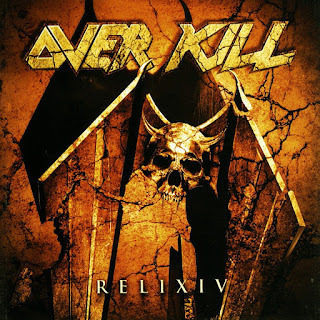 That said, each new Overkill release is not unlike each new AC/DC release -- you know exactly what you're going to get. Variety may be at a minimum here, but by now, it's clear that that's how Overkill and their fans like it, as evidenced by such dense n' intense tracks as "Within Your Eyes," the Spinal Tap-like titled "Bats in the Belfry," and the rapid-fire riffs of "A Pound of Flesh." Expectedly, ReliXIV won't win over any nu-metallists, but it will definitely please the long-ago converted.